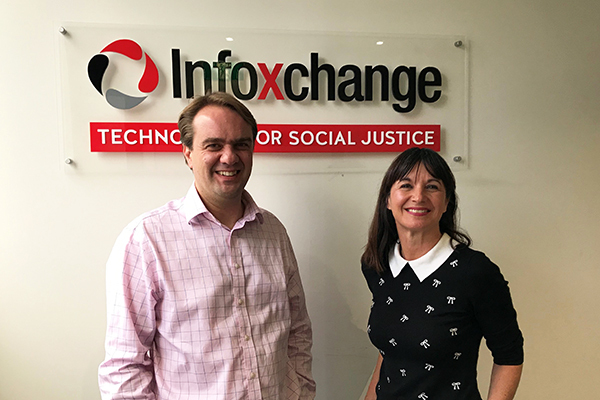 Infoxchange and Connecting Up are joining forces to create Australia and New Zealand’s leading not-for-profit dedicated to using technology to improve the lives of people experiencing disadvantage and the organisations that support them. Infoxchange Board Chair Stan Krpan says Infoxchange and Connecting Up share a similar vision of using technology to strengthen the not-for-profit sector and to empower people and communities. “By integrating our two organisations, we’ll be able to achieve greater reach and impact across the communities we serve,” says Stan. Connecting Up Board Chair Susan Arthure says Infoxchange and Connecting Up already enjoy a close working relationship and have collaborated in a number of areas over the last several years. “We’re delighted to be joining together, and we’re excited by this opportunity to work together to expand our reach and support of the sector,” says Susan. Connecting Up Acting CEO Sandra Vallance says she believes not-for-profits that have the right tools and skills can achieve great things, and that the integration of Infoxchange and Connecting Up will help them do even more. “Together, we are well-placed to elevate the sector and the communities they serve,” she says. Under the new arrangement, current Infoxchange CEO David Spriggs has been appointed as the new Group CEO, bringing to the role over 20 years’ experience in senior management positions in the not-for-profit and technology sectors. “David has led Infoxchange since 2013 and has overseen considerable expansion and growth in the organisation and delivered huge social impact over that time,” says Stan. Group CEO David Spriggs says technology has the ability to transform lives and that the integration of Infoxchange and Connecting Up will help more people than ever to benefit from today’s digital world. “Together, we’ll be able to provide a comprehensive set of technology solutions to help improve the lives of people experiencing disadvantage and the organisations that support them,” says David. The integration brings together 150 staff members working to support more than 30,000 not-for-profits and over 2 million people in need each year across Australia and New Zealand. The two organisations will officially join forces on 30 November 2018, with Connecting Up to become a subsidiary of Infoxchange. Connecting Up will continue to trade as TechSoup New Zealand to serve the not-for-profit sector in New Zealand. Infoxchange is a not-for-profit social enterprise that has delivered technology for social justice for over 25 years. With over 130 staff across Australia and New Zealand, we tackle the biggest social challenges through the smart and creative use of technology. We work with community, government and corporate partners to solve family violence, homelessness, mental health and issues facing people with disabilities, the elderly, Aboriginal, Maori and Pasifika communities. Our products and services are used by over 8800 organisations across the community sector. We provide the right tools to improve efficiency and deliver greater impact – from nation-wide service coordination systems to IT advice for individual organisations. Our community programs focus on digital inclusion. We use technology to improve the lives of vulnerable people, driving social inclusion and creating stronger communities. We believe no-one should be left behind in today’s digital world. Connecting Up Inc was established in 1981 as Community Information Support Service of SA Inc. (CISSsa). CISSsa was established as the peak community information agency in South Australia, providing essential community services information in a variety of print and, later, electronic formats. CISSsa later changed its name to Community Information Strategies Australia and is now Connecting Up Inc. Connecting Up’s purpose is to help our fellow not-for-profits leverage the digital world to positively impact their communities. The digital world is ever expanding beyond IT software and hardware, digital marketing, fundraising to new and innovative service delivery and understanding/measuring impact. We have a long history of affordable software, hardware, educational events and more recently group consulting. We believe that not-for-profits with the right tools and skills can and do achieve great things. We work in partnerships with over 40 organisations to deliver high-quality products and services specifically meeting the nuanced needs of the not for profit sector. Connecting Up's and TechSoup New Zealand’s services are available in Australia, New Zealand and throughout the South Pacific. In addition, Connecting Up also helps to develop relationships with business, community and government sectors for the development of the not-for-profit sector. For all media enquiries, please contact Cathy Culliver.